Do you ever have one of those days where you really don’t feel like doing a dang thing? You know what kind of day I mean. One of those days where even getting dressed feels like it might be too much effort. The only thing you really want to do is curl up on the couch with a huge mug of coffee and your favorite novel. Of course about halfway through my day of vegetating on the couch, I suddenly remembered my promise to take at least one photo a day for 30 days and began some serious grumbling. I have to admit I was truly tempted to take a quick picture of the couch, but I resisted when the dogs started grumbling too. I needed to go to the post office anyway, so I grabbed my camera while mumbling to myself that there must be something in town that I could take at least ONE picture of. 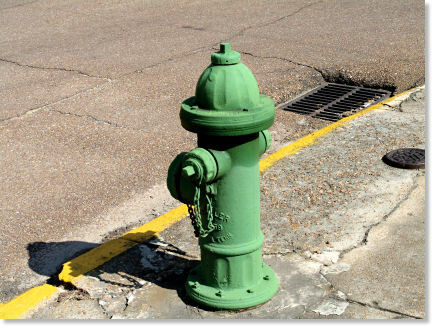 I figured that as a last resort you were going to be stuck with a picture of a fire hydrant since that was about how artistic I was feeling. So maybe, just maybe I would take ONE more picture, but dang it, there better be something worth looking at right on this same block because that is just about how long I intended to be out there. Oh yessssss! Right across the street there is this incredible mural on the side of the old dry cleaners. And, with a zoom lens I don’t have to take a single step. Zoom in, click the shutter and I’ve got it! Yeah, I know I could have taken a few extra moments to at least crop the picture and make it all pretty like for ya, but I wanted you to see that it really is on the side of an old building. Besides, I am pretty sure I can hear the couch calling my name . 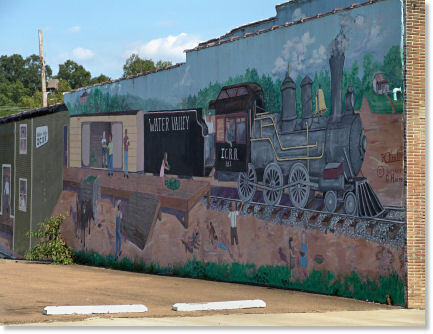 . .
I’ve seen murals on walls like that in a little bayside town in Texas. Of course they are water related. Trains are special. Glad you shared it with us.